An IVA (Individual Voluntary Arrangement) is a debt solution suitable if you are struggling with debts over £10,000 (lower in some cases). It provides legal protection from creditors and allows you to repay what you can afford towards your debts. An IVA can be considered as an alternative to bankruptcy. Instead of going bankrupt you agree to pay a portion of the debts back with monthly repayments that you can afford. On completion of the IVA any remaining debts are written off. Due to an IVA being a formal agreement your creditors will be bound by it's terms. Read on to find out more about an IVA or fill in the form and one of our advisors will contact you to advise on your debts. Is an IVA the right choice for you? The easiest way to find out if you qualify is to call our advisors or fill in this form below. We will be able to tell you in less than 5 minutes if an IVA is the right option for you. *Please note: The above criteria are a rough guideline for an IVA. In some cases an IVA can be done with lower debts and/or with a lower monthly payment. It is also possible to do an IVA with only 1 creditor (in some cases). Our client was struggling to keep up with monthly payments of £750 on credit cards and loans totalling £33,000. They contacted us to find out what help was available. After analysing their situation it was determined that they could realistically afford to pay £240 per month after all essential living costs were taken care of. They decided that an IVA was their best course of action. We were able to agree an IVA with their creditors where they paid reduced monthly payments of £240. 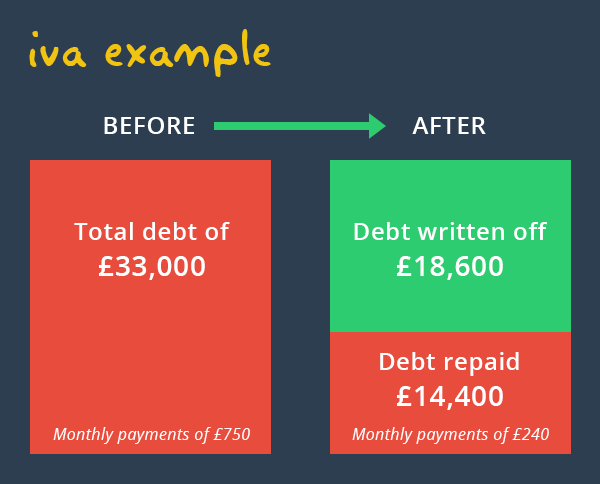 At the end of the IVA they will have repaid a total of £14,400 (44% of their total debts) and the remaining debt of £18,600 will be legally written off. Contact us on 0800 043 5133 or fill out our form above and we will call you. Tell us about your circumstances, debts, income, living costs. Tell us about anything you have to pay out regularly so that we understand your situation in full. We will then discuss your options and explain them all in detail so you can understand what options are available to you and the implications of each. If an IVA is appropriate for your circumstances and you want to proceed with it, we can start working on your IVA proposal. Once we have drafted your IVA proposal we send it to you for your review and signature. We contact your creditors with your signed IVA proposal and ask them to accept it. This involves negotiating with them, so the more we understand your situation the better we will be able to explain it to them. Upon acceptance of your IVA you will start making your payments as agreed in your proposal. Upon successful completion of your IVA any remaining debts will be written off and you will be completely debt free. What debts cannot be included in an IVA? How is an IVA payment Calculated? In an IVA, we work out what you can afford by analysing your income and expenses. There are allowances set out by The Insolvency Service that help us to work out what reasonable living expenses are best for your situation and what you are paying for each month. Once we have calculated all expenses, the left over money that is available each month from your income is the money that is available to go towards your debts each month. This will be your proposed monthly IVA payment towards your debts. An IVA usually lasts for 60 months (5 years). In some circumstances however, an IVA can be completed in a few months, but this would normally involve introducing a Lump Sum into the IVA. In some circumstances, an IVA can last more than 5 years (ie if you are a homeowner with equity in your property). The length of time your IVA will last will be discussed and determined in the IVA proposal, once all of your circumstances have been taken into account. Are there different types of IVA? There are different types of IVA. See below. Self Employed IVA: Applicant is self employed. This type of IVA requires an accountant to work with the Insolvency Practitioner as it is important that the self employed person's business is understood. We are experts in this area. Assisted IVA: all debts are in one person's name but in order to be accepted payments need to be contributed to by another person. With us there are no upfront or hidden fees. Fees for managing your IVA are agreed by creditors and come out of your monthly agreed payment to creditors, so you will never receive a bill from us. Creditor pressure is stopped as creditors will have to deal with all issues through us. An IVA can be complete in as little as 1 year if you can offer a lump sum payment. All interest is frozen immediately when you start your IVA. An IVA is suitable for tenants or homeowners, individuals or couples and even business owners. We can set up an IVA in as little as 4 weeks. What are the drawbacks of an IVA? Your IVA is entered on a public register. If you are a homeowner with equity in your property you may be required to introduce part of your share of this equity in the final year of the arrangement by means of a remortgage. If you can’t get a remortgage you might have to continue making monthly or quarterly ayments from your income for up to 1 more year. How much does it cost to do an IVA? You cannot do an IVA for free as it involves a lot of complex procedures and requires the use of a professional (Insolvency Practitioner) to prepare, negotiate and administer your arrangement. It also requires the use of a supervisor to oversee your arrangement for it's duration. We are one of the few IVA companies who do not charge any upfront or hidden fees for an IVA, which means you will not be charged a penny if your IVA proposal is unsuccessful. Any fees we receive for your IVA come from your agreed monthly payments to your creditors. It is your creditors who determine what we are paid for your IVA case. They allow us to retain a small percentage of your payments to allow us to carry out all of the work to manage your IVA for the duration of your arrangement. You will NEVER receive a bill from us. We will create your IVA proposal and send it to your creditors without taking any payments from you. We operate a 'NO IVA : NO COST' policy. In the event that your creditors reject your IVA proposal you will not owe us anything. Can I do an IVA if I cannot afford a monthly payment? Every IVA is unique and the offer that you put forward to your creditors will be based on your circumstances. All IVAs are different. You may not be able to offer monthly payments but sometimes we get clients who can offer a lump sum (redundancy payment, money from parents or friends, or simply savings for example). Creditors will look at any offer that we propose on your behalf. On occasions where the only offer available is a lump sum payment creditors have been known to accept a repayment of less than 10p in the £ (10% of the original debt owed). It is also worth enquiring with us about an IVA because we may be able to help you in working out if you can actually free up money somewhere each month that you were unaware of. i.e. money that you were currently already paying to your creditors. What happens on completion of an IVA? When your IVA is finished, the remainder of your debt is legally written off and you will become DEBT FREE. You will be able to make a clean and fresh start to your finances and your life. Your IVA company will send out your certificate of completion withing about 4 to 6 weeks of your final payment. Contact us at Debt Advice to discuss your situation. We will discuss your information and analyse whether an IVA is indeed the best course of action for you to take. We determine your suitability for an IVA by working out your income, expenditure and circumstances, taking into account your level of debt. We will also inform you of your other options. If you want to proceed with an IVA with us, we will draft your proposal and put it to your creditors for voting. If more than 75% by debt value of your creditors agree to the IVA, your IVA becomes legally binding. Provided you stick to your monthly payments, your IVA will continue and after the specified time, you will be free from all the debts involved. Will I have to sell my house in an IVA? You do not have to sell your home in an IVA. Your house is protected in an IVA as long as you maintain your mortgage and IVA payments. If you have equity in your home, you may need to release it in the fourth or final yr. This will be discussed during the set up period of your IVA. The amount released is generally only a percentage of the equity. You might not be able to obtain a remortgage, in which case your IVA could be extended. Most Creditors are aware of an IVA as it has been in force since 1986. If the majority of creditors by amount of debt (75% to be exact) agree with your IVA then all of your creditors are then bound by its terms. Before voting, creditors can request certain changes to the IVA proposal and you can choose whether or not to accept them. If your creditors vote against your proposal you still have the option of an informal arrangement. When you enter into an IVA you must surrender all your forms of credit (i.e. store cards, credit cards etc) and you will not be allowed to obtain any further unsecured credit until you are finished your IVA. You are entitled to use pre-paid cards. The bottom line is: If you are looking to enter into an IVA, it is highly likely your credit rating is not in a good way. By entering into an IVA, you will not have a bad credit rating forever and when you have completed your IVA, your credit rating will begin to repair. nb. During an IVA, it is possible to take or change a mortgage but you will need to make sure you get the advice of your Insolvency Practitioner for this. We are part of McCambridge Duffy, who are one of the leading IVA providers in the UK. IVAs have to be supervised by an Insolvency Practitioner (IP). We have 5 full time Insolvency Practitioners in house. The reason for this is that we feel it is important that our clients are able to speak to their own Insolvency Practitioner if they wish. In most other IVA firms you would deal with supervisor staff who report to the firms IP. Our IPs are subject to regular inspections by their regulatory body. IPs are very highly regulated professionals and must be licensed to offer IVAs.